There is a new little something that made my heart melt last week at the grocery store. 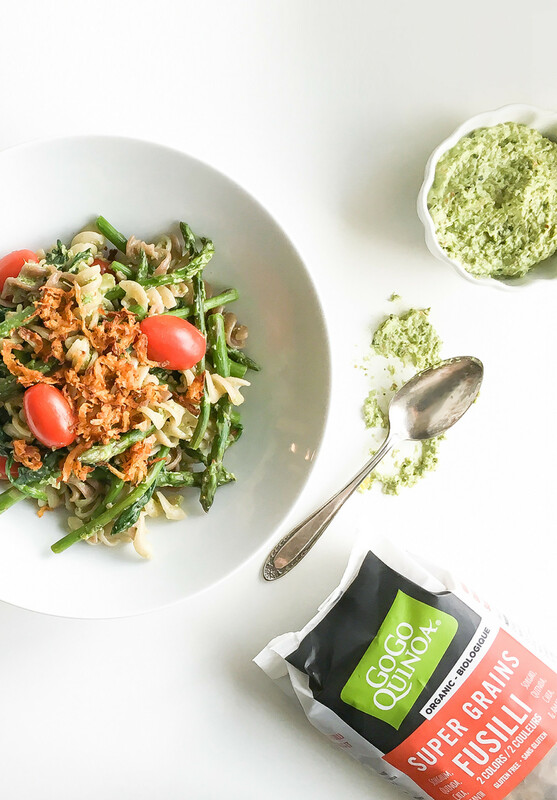 I am not talking about my boyfriend here him too, but the all-new GoGo Quinoa vegan pasta! Yep, you got that right! It’s the perfect combination between eating healthy and eating responsibly for our heart and our earth! Here is my new recipe of asparagus pesto, tomato and spinach vegan pasta topped with amazing fauxmage. Rinse the asparagus and cut them in half. The top half of the asparagus with the head will be used in the pasta, the bottom half of the asparagus will be used in the pesto. Before dividing the asparagus in half, make sure to cut the woody bottom off and throw it away. In a food processor, add the bottom half of the asparagus as well as all of the ingredients “FOR THE PESTO”. On high intensity, mix until you obtain a smooth pesto. Set aside. With a strainer, quickly rinse the shredded potato. Using your fingers press down the shredded potato to eliminate any excess of water. In a small bowl, add the shredded potatoes as well as the ingredients “FOR THE FAUXMAGE”. Mix until well combined. On a baking sheet, spread out the fauxmage and bake for about 5 to 8 minutes. Cook the pasta according to the instructions on the package. When your pasta is 4 minutes away from being ready, add the top half of the asparagus. Strain the pasta and the asparagus once ready. In a large skillet, add the olive oil and the spinach and wilt over medium heat until softened. Add the pasta, the asparagus, the tomatoes and half of the pesto to the large spinach skillet. Mix until the pasta is evenly coated with pesto. Serve warm in a bowl topped with fauxmage. The other half of the pesto can be preserved in a Ziploc bag in the freezer. Simply add the pesto to a Ziploc bag and gently press down to eliminate the air. Seal the bag and freeze. The next time you want to use the pesto you can simply break out the piece of pesto that is needed for your recipe. *As part of our product testing panel we have been gifted this product. At Sparks and Bloom we offer to companies the possibility to talk about their products for free. To be part of our product testing panel, simply submit the product you would like us to try and if we like it, we will make sure to talk about it.